When there is almost 4 weeks notice time for me to whip something up, one would think it will get done by the third week at least. Mmm Hmmm – No No. This is my second DB challenge and I ended up doing this too in the last minute. This month’s challenge was hosted by Lisa of Parsley, Sage, Desserts and Line Drives, and Mandy of What the Fruitcake?!. The challenge was making candies, a real challenge – since I didn’t know where to stop! Tempering of chocolate is out of question for me since I don’t have any candy thermometer and again, for the hot and humid weather here, it wouldn’t have worked well. So truffles it was, since it didn’t need any thermometer. I decided and planned, in my mind of course, but didn’t spring into action till the last minute. Now for truffles, you need cream. And last week I went to at least three supermarkets in my area and they were out of stock. I have never had that problem before. Its always there when I don’t need it, and now that I want it, its out of stock! Well, I came home and made some chocolate bark instead. I would have loved truffles though. I didn’t temper the chocolate, but melted them in microwave. 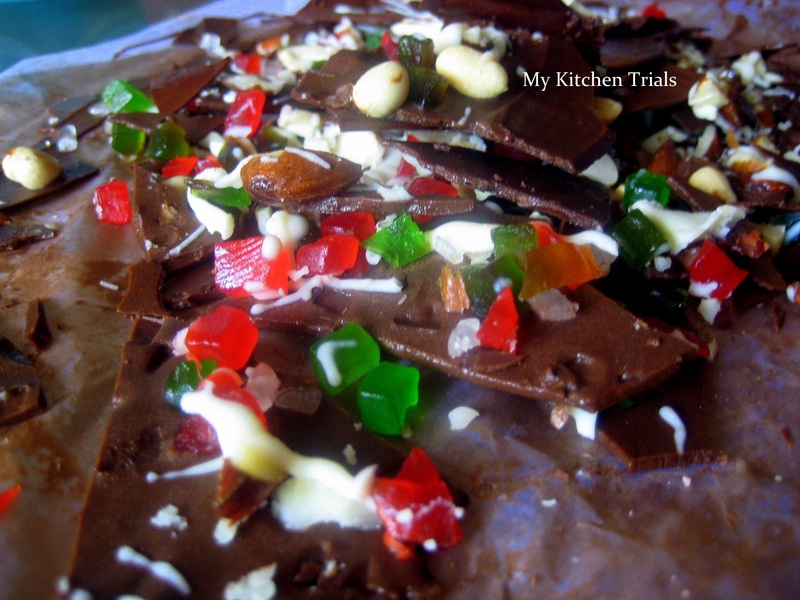 Added a bit of this and that and tada… a beautiful chocolate bark. I made peanut chikkis, called kadala mittai locally. The cooking disasters there deserve a separate post. So reserving that for a full post later, but the picture shows what I had after the third trial. 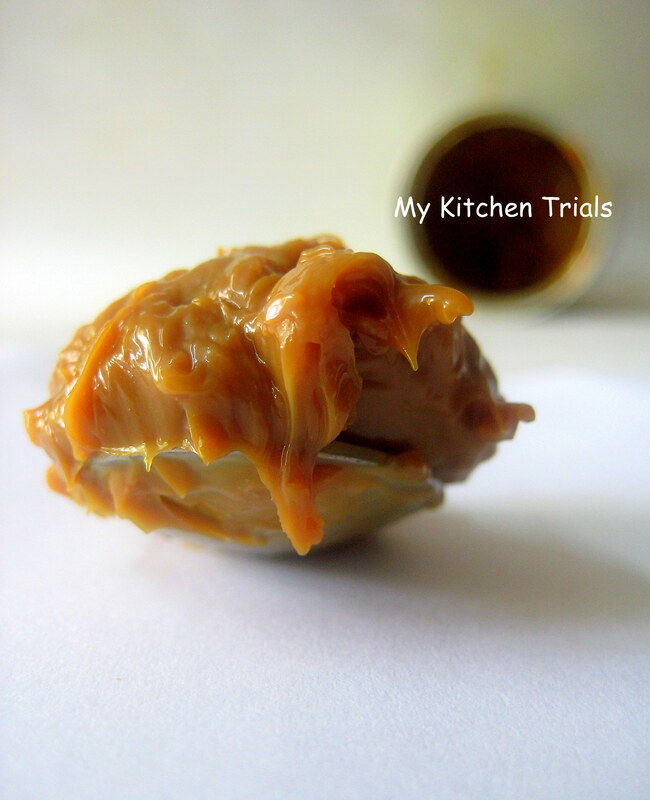 I had made Dulce De Leche too, unrelated to this challenge. Scroll down for a photo of that, the full post is available here. The last one is Chocolate Fudge. The plain old traditional recipe. It was yum yum yummy! I made it in the evening one day and there was hardly any left by morning. The recipe is adapted slightly from here. This is not really a recipe, just the summary of what I did. Melt the chocolate and white chocolate in separate containers in the microwave. 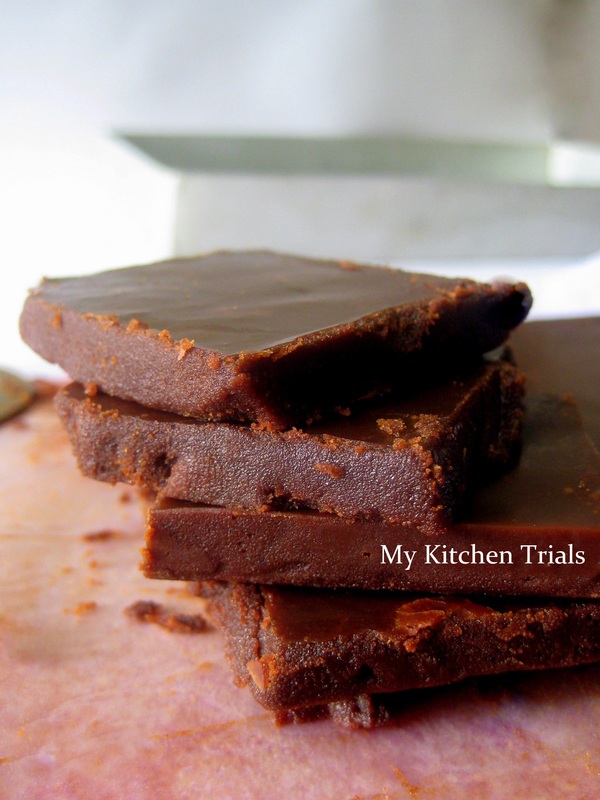 Mix thoroughly every 30 seconds.Stop when all the chocolate has melted, making sure that the chocolate doesn’t burn. Keep the white chocolate aside. Spread the chocolate in a parchment paper. Put the toppings and press them a bit so that they won’t come out. Drizzle the melted white chocolate on top. Refrigerate till it is set. Break into pieces and enjoy! Grease a square baking pan and set aside. Add milk, sugar and cocoa in a big, thick bottomed vessel and mix till well combined. Bring this to a boil, stirring continuously. Reduce the heat to minimum and stop stirring completely. This needs to be cooked till temperature reaches 238 degrees F(114 degrees C) in a candy thermometer. Else, you can cook till a drop of this mixture forms a soft ball when put inside a cup of cold water. The ball should flatten slightly between your finger when you touch it. Remove from heat. Add the butter and vanilla extract. Beat with a wooden spoon until the fudge loses its sheen. Pour into the greased pan and let it set. Thank you Lisa and Mandy, the real challenge wasn’t making these – it was resisting the temptation to finish these off in one go! que de délicieuses gourmandises!! j’ai envie de lécher mon écran!! I love the peanut chikki! They look tempting. Very well done. Despite the lack of a thermometer, and the mysteriously gone cream, you came up with the most mouthwatering candies :) Gorgeous photos! So many sweet indulgences in one post.. Yumm.. It looks like you had a lot of fun with this challenge! 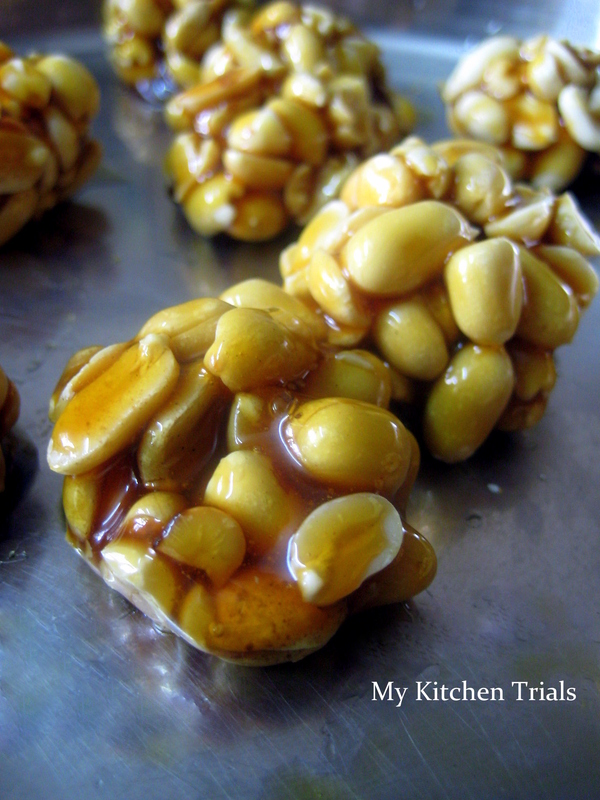 Your peanut candies look really good – I am curious to hear the story about them…! Thank you for sharing the fun! I am having a problem of plenty here! The last picture of the fudge takes the prize! So tempting and yummy. Loved all of them. Agree with cool lassie, i scrolled so many times up and down thinking which one do I applaud for the loudest…i love them all. Seriously am drooling over those irresistible candies, am drooling over that peanut chikkis..
I’m intrigued by the peanut chikkis… they all look great though! I’m impressed you found time to whip up four treats at the least minute! I just found time to make two over the course of the month. That bark looks delicious! how perfect is that chocolate bark for christmas? it looks so festive! your pics are beautiful! but i wish i hadn’t seen the one with the dulce de leche… i’m using it for something else this morning, and it just makes me want to shove a huge spoonful in my mouth! great job on the challenge! All of the candies look so tempting! 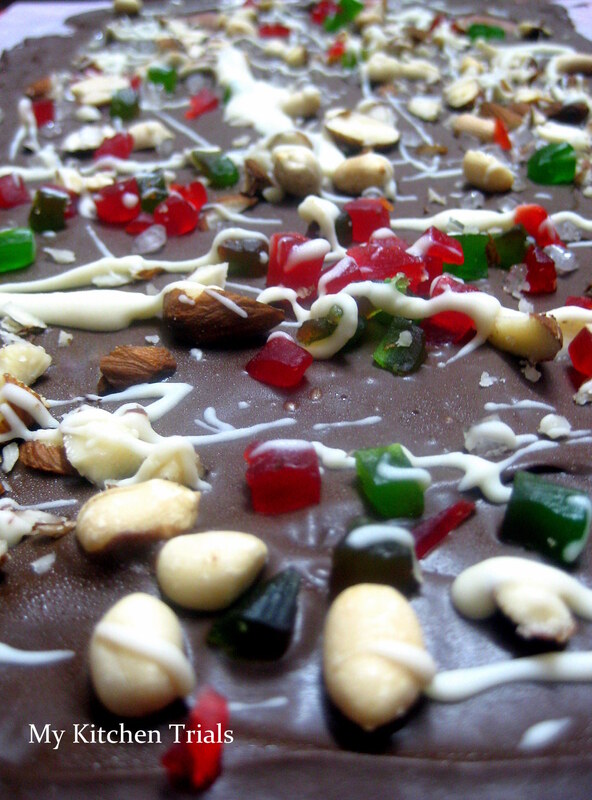 And I love the colors of the chocolate bark, it’s just perfect for the holidays. The peanut chikki looks so amazing, I’m so intrigued by it! That said, your candies are beautiful, and that photo of the fudge is enough to being a grown woman to her knees, namely me! So glad you took part in our challenge this month! The candy looks really good, nice job on this month’s challenge. Now if I could only get some of that Dulce de Leche and those Peanut Chikki’s – Yum! Wow! You did an amazing job on this challenge. Looks professional ~ beautiful pictures to go with the beautiful treats. Impressed! I just adore chikki! You have me drooling here and that fudge looks grab-it-right-now-and-bite-into-it-good! Great job on the challenge! Well done on your second challenge :) And welcome to the Daring Bakers. I remember when I first started I was very gung-ho, tried to do all my challenges in advacne. Now it’s usually last minute, sometimes cooking right on reveal day! I loved your peanut chikki post too, youa re so right, sometimes the simplest things can be hardest. And I’ve done the “melt sugar in non-stick pan” thing before too. They are absolutely yummy, tempting nice shots.